Coming straight off the back of last week's Mini Direct, Nintendo made yet another crowd-pleasing announcement yesterday, with the reveal of Nintendo Labo; a new game/application for the Switch which allows players to enjoy virtual entertainment through a mix of the console's sensory technology and good old fashioned cardboard DIY. It's... hard to explain, but the brilliantly wacky trailer (below) gives you a good idea of how Labo will work in practice. And we've got details of the Nintendo Labo price too. 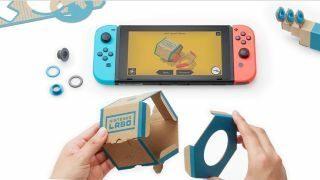 It's due to release this April, starting from around $69.99/£51, depending on which bundle you buy, but the internet has already kicked off the meme train for Labo, as Twitter reacted to the announcement with a flood of pithy reactions and sly jokes. Here's some of the best responses to Nintendo Labo that we've come across so far. You can be a robot, drive motorbikes, go fishing, play the piano, and do much more with Nintendo Labo, all through the power of cardboard!.. Wait...what?! They did say it was for kids! Nintendo teased the announcement beforehand as an experience designed for "kids and those who are kids at heart.” Sadly, some of us didn't get the message. Nothing is out of the question for Nintendo Labo's cardboard-based potential. NOTHING. Whatever you do, don't play Nintendo Labo in the rain, next to an open fire, or in close proximity to the post office. You can always count on the Kaz Hirai parody account for some classic timely banter. So what did you think of Nintendo's latest creative gambit? Sound off in the comments below, and feel free to send us all the memes.